Oberon is an enjoyable read and contains all of the theatrics that the reader is coming to expect from Parrott, Slavkovic and Pritchett. There are a few dips in the narrative but the Art pulls the reader along. The creative team behind the AfterShock Comics title Oberon are committed to the telling of tall tales. They adapt the stage tradition of weaving stories within stories to entertain the reader and further the main plot. With a theatrical style and some myth building panache, Oberon continues to prove that there is still room for traditional fantasy titles on the shelves of modern comic book stores. This issue of Oberon is a tale of tales. Each lacking in obvious moral and containing holes that don’t get filled. There is a hope in the reader that each tale will relate to another and a common theme present itself but unfortunately this doesn’t happen. The initial tale of two brothers is vague and lacks any real substance, seeming to exist only to explain the Pig Man who roams the labyrinth that Bonnie has been left in. It would seem that Ryan Parrott loves they idea of subverting myths and legends and tweaking them to fit his new world. Although there is nothing wrong with this in principle, for it to have any gravitas either the new myth must be exquisitely told or be integral to the plot. The tale of the pig man is neither of these. Nicholas’ tale is different. Through the script and the visuals, it combines lies and truth to relay his initial meeting with Oberon. This contrast of ‘pretty words’ and violent, harsh visuals is representative of fairy stories the world over. The Brothers Grimm made a career out of exploiting gruesome folk tales and retelling them for a more discerning audience, this is something that Parrott is drawing on here in Nicholas’ tale. It sheds light on one of the central characters and how he views the world but it is also a comment on fairy stories as a whole. The final tale incorporated into Oberon issue 3 is a combination of both examples above. It is a biased tale strongly refuted by the subject. Because of Nicholas’ tale before it, Parrott has already informed the reader how stories can be true and yet lies at the same time. Therefore, the conflict at the end of this issue is an intriguing cliff-hanger because, as readers, we do not know who to believe. Parrott weaves his stories around the central cast, hinting at something greater. Bonnie is a mystery much like the Tim Hunter character from the early issues of The Books of Magic, her potential and significance is as yet unknown but Parrott is slowly revealing her importance. However, a lot of time is spent on insignificant things in this issue and much of what happens has no resolution. 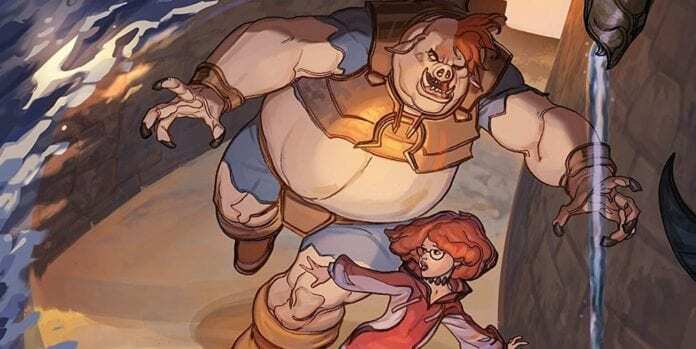 This is turn makes parts of the plot redundant and, like the Pig Man’s tale, it seems to exist purely for the sake of an idea the writer didn’t want to discard. What really moves Oberon along, pushing the reader through the early pages especially, is the energy and vibrancy of Milos Slavkovic’s artwork. His painted visuals provide the perfect backdrop for the mythical land of fairy that Parrott is creating. The dream-like backgrounds are a soft setting for the theatrics to play over and do not distract from the cast of characters. 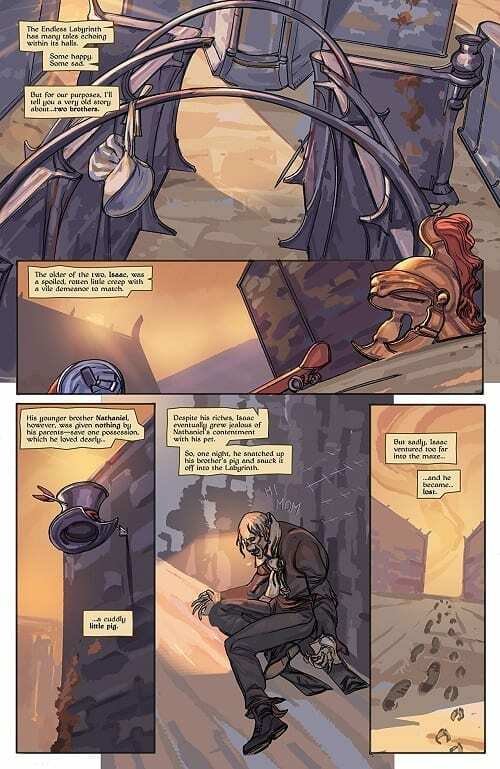 The rendering of the characters themselves is wonderful with strong silhouettes and color coding to make them instantly recognisable on the page. The traditional and recognised look of fairy tales is mixed with a Shakespearean flourish to produce visuals that are engaging and theatrical. 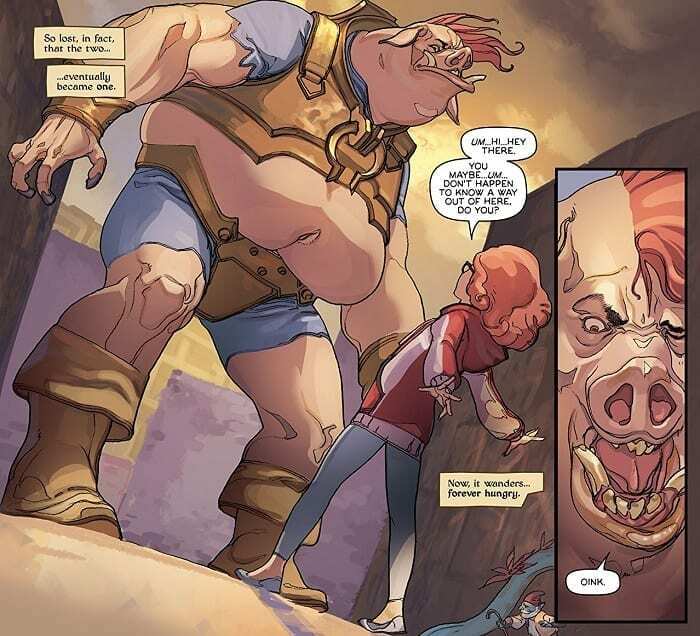 The pages have a staged look to them befitting the narrative but also capture the energy of a family fantasy movie. When Bonnie, for example, runs through the labyrinth with the Pig Man towering above her, there is a sense of danger and foreboding. The beast is unnaturally large, dominating Bonnie in every panel, and more often than not, across panels. This in turn makes Oberon’s intervention even more impressive. One artistic touch that was evident in the previous issue, played a part here as well. There is a moment where the background from one page is repeated on another with the same layout of panels but only altered foregrounds. This is a clever visual reminder for the reader that stories interact, rerun and repeat. All stories are based on something, and time and time again the same stories are updated for a new audience. This is what Parrott is doing with Oberon and Slavkovic acknowledges that in his art work. The theatrical nature of the comic is once again illustrated wonderfully through the lettering by Charles Pritchett. He gives the caption boxes a look of scripture, as if the writing is part of an old text. The speech balloons are packed with emphasis and rhythm, with the text being laid out like lines from a play or poetry stanzas. The inflections of the actors have been picked up by Pritchett who bolds text or separate’s speech to illustrate this. 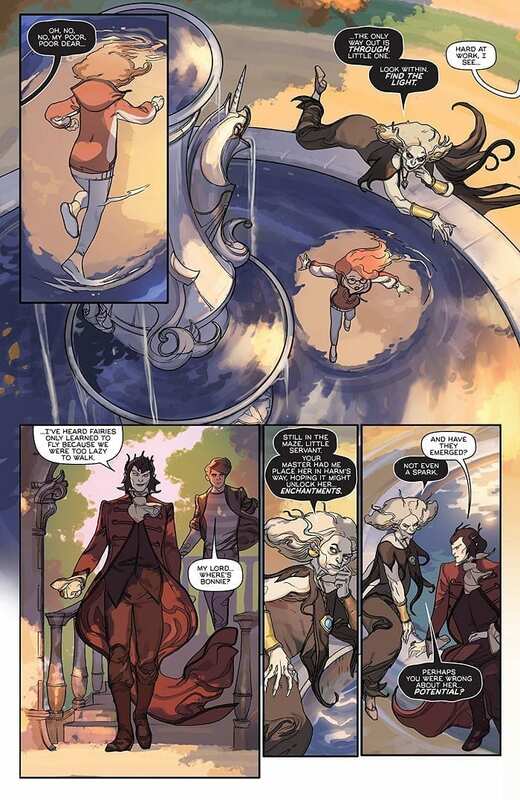 Overall Oberon #3 is an enjoyable read and contains all of the theatrics that the reader is coming to expect from Parrott, Slavkovic and Pritchett. The world building is on the whole enjoyable, with the art making up for any deficiency in the telling of the tales. In this issue some of the elements of the story are superfluous and exist for the sake of existing however, it does not ruin the overall reading experience. It is a shame that the weakest section of the comic is at the start.